Condor introduces their premier assault pack for the Elite line. The Titan excels in form and function offering the most premium materials and craftsmanship. 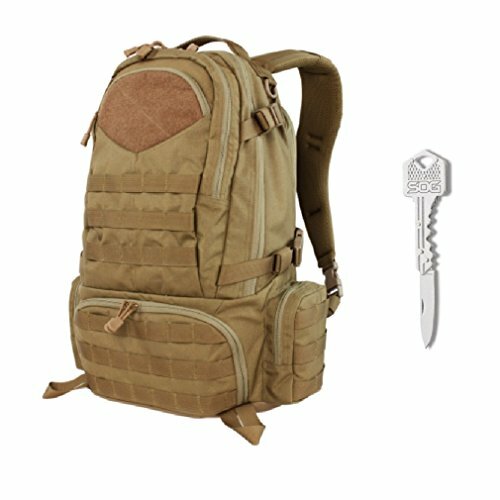 This new Assault Pack represents a new generation of functionality, durability and organization. It is almost too feature rich to mention them all. The Titan offers space (40L) and comfort you need to keep your performance at its peak. (see features below for more size information) The Titan is constructed with Invista Codura Mil-Spec Nylon, high tensile strength composite nylon thread & webbing, the Titan comes equipped with many premium features like a rugged, high abrasion-resistant rubber rhino-skin reinforced bottom, YKK zippers throughout, fleece lined gadget pocket for scratch protection as well as an Air-Flow system on the back to maximize ventilation. Curvaceous & breathable mesh-padded double shoulder straps contour to your chest and a sternum suspension strap helps distribute weight evenly throughout your upper body. The wide load-bearing, breathable & mesh-padded waist belt allows you to carry heavier gear with more support and comfort. A dual access main compartment (14"W x 22"H x 6"D) with U-shaped zipper and internal mesh pockets, can be separated into two compartments with an internal divider. The backside compartment has a pocket that can double as a laptop or hydration locker with wire or tube access to the top. The top front compartment contains an organizer panel while each side contains a quick access side pouch (5"W x 6"H x 2"D). Also included is a drag handle, strategically placed D-rings, side compression straps (4), Hook-and-loop field, and grommets on all compartments.